A footballer has died a painful and cruel death after he was gunned down by an armed gang during a football game. A Mexican footballer was shot dead after an armed gang invaded an amateur match and fired over 100 gunshots, The Sun UK has reported. According to local sources, the 20 men armed with rifles after the murder then kidnapped a fan after trying to steal mobile phones and wallets. The gang then allegedly asked for Tepeaca's No 9 before they brutally opened fire on him. Horrific images show the footballer, who is said to be in his late twenties, lying face-down on the floor in a pool of blood. Some 40 police officers arrived and investigators found over 100 used bullet casings on the pitch. Local media reports also suggest that the gang then kidnapped a 19-year-old man as they left the ground. The authorities are said to have found the kidnapped teenager hours later by a nearby motorway. He told police that the men had confused him with someone else and let him go when they had realised. Police sources have said that they believe the murder is linked to a confrontation that took place at a petrol station the day before. 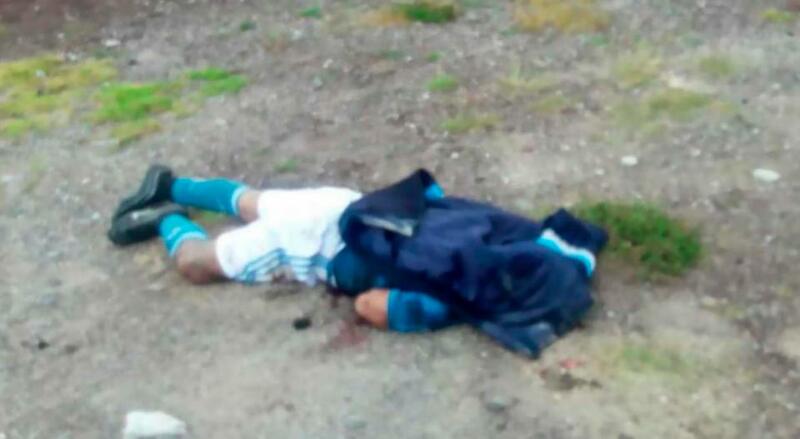 This incident took place at an amateur football match in the town of Tochtepec, which is in the Mexican state of Puebla. It is understood that no arrests have been made.